Bob Woodruff's face is so familiar to us, whether he's coming to us locally or from afar, via our television sets. It's on ABC News that we've come to recognize and know this man. This is the story of how he almost died while reporting in Iraq because of a roadside bomb explosion, and about his horrific injuries and his miraculous recovery. It's also a love story as his wife Lee kept a journal during this agonizing time. Things happen "in an instant," which are beyond our control, and from these happenings come lessons. Not everyone gets the lesson, but Lee and Bob did, it seems. We think we know so many people we're familiar with on television. We don't. There's a completely different aspect to their lives most of us don't have a clue about. Now it's different with Bob Woodruff. Now we know so much more about his man, about his wife, and their family and friends. They're just another family. Kind of. Bob Woodruff was a lawyer before turning journalist. He speaks Chinese and even taught Chinese students American Law in China. He's an adventurer in his off-time. He has a loving family and a solid marriage. One can't imagine the terror, fear, anxiety, or any of the emotions you go through, either as the patient or as the loved ones standing by, when you have someone close to you lying critically ill in hospital. 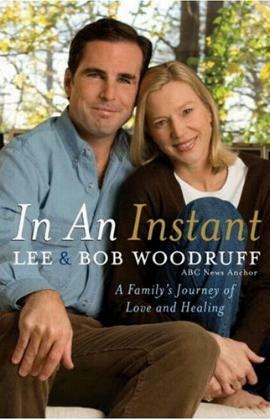 Lee and Bob Woodruff wrote this book describing how it was for each of them during this dreadful time. Sometimes it's raw emotion, other times it's the incredible support they both received. And it's always moving. Bob's injuries were nightmarish and traumatizing (not only for him), but such is his desire and determination, it wasn't long before we saw him and his wife on television, both looking remarkable. They were facing uncertainty and the possibility of assisted living for Bob came up, as did seizures, Tourette's, memory loss, and more. Visit the Woodruff's Foundation at their website at www.bobwoodrufffamilyfund.org for more information on Traumatic Brain Injury. You can make a donation here if you like. Conclusion - A powerful love story of courage under fire. Extremely interesting.